India Mike » India Travel » Cities in India » Delhi » What Metro card to buy? What Metro card to buy? One trip Rajiv Chowk to Hauz Khas will cost 30 Rs. With card you get 10% discount. The longest possible tour will cost you 60 Rs for one tour. So no problems with loaded card for 750 Rs. 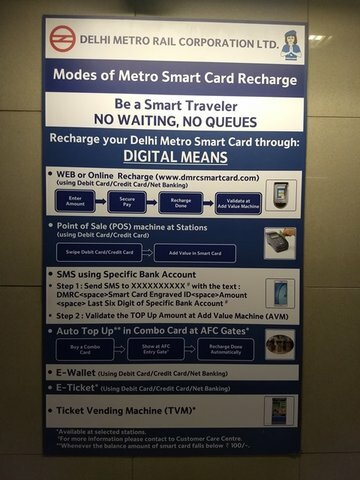 Today I took these two photographs at Rajiv Chawk metro station (connaught place), describing how to top-up the smart cards, and the rules for refund. And today I was travelling in Metro, scheduled for an interchange from yellow line to violet line at central secretariat station to reach ITO. But Violet line was closed due to technical snag (though I guess it was due to security reasons or VIP movement, there were lots of heavily armed security personnel along with sniffer dogs). So again I had to come back to yellow line platform and board next metro to reach Rajiv Chawk, and walk!!! Pathetic service!!! Daily commuters can only understand the pain. I normally don't have any major problems commuting by the metro. I prefer it over Uber due to the congestion on the road. The metro is very crowded in the morning and evening rush hours but that's the only downside. In general, I find the users well behaved and the service very reliable - I use blue and yellow lines. I do feel that under recovery of costs will impact the system adversely, raising charges is a partial solution - more effective utilization through reduced frequency in off peak hours would work better. I believe if there are systems that I'd avoid - those would be the Kolkata metro (air-conditioning failure) and Jaipur (starts nowhere and ends nowhere). Didn't want to stick this in an old dusty thread. Mods feel free to move it around. This may be useful for the tourist crown in Delhi. After years of only doing work in India I am rediscovering the attractions in India..
Can I buy metro card at the metro station in Terminal1 IGI? Flying in on tuesday, and taking the subway towards haus khas from there. Might as well get my card there. Can i do there as well? Can i pay credit card or cash only? Originally Posted by mchp92 Can I buy metro card at the metro station in Terminal1 IGI? You can buy a metro card at the IGI airport metro station at Terminal 3 and use it on the airport line. 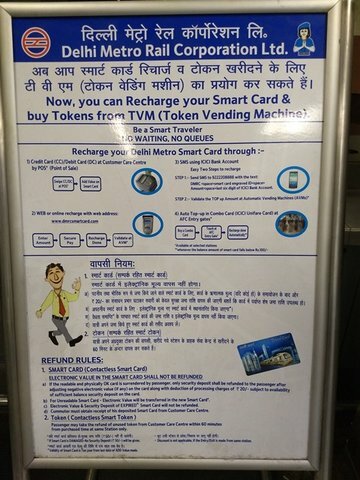 Before you can use it on other lines it has to be "endorsed" at customer care at a metro station. I presume you will change at New Delhi Railway Station. Get it done there before boarding the Yellow Line to Hauz Khas. The alternative would be to take the bus to Terminal 1 and take the Magenta Line from there. it goes directly to Hauz Khas. Mchp92 wants to buy the dmrc card from terminal 1 metro station. Yes, you can do it. And the magenta line goes to hauz khas station. If you wish to change to yellow line you have to walk about 700-800 meters for interchange.